Inevitably, individuals who work with animals in the context of biomedical and behavioral research will sometimes form bonds with the animals with whom they interact. Such attachments are the results of compassionate people doing their job right. Moderator: We have discussed on several occasions how important the establishment of a mutual human-animal trust relationship is in the research laboratory setting. Not only is it a safeguard that the animal receives the best possible care by the human, but it also helps to minimize or avoid stress reactions when the animal is subjected to potentially painful or uncomfortable procedures. It has become quite clear that many of us do form such bonds quite spontaneously with non-human primates and dogs. When we work with rodents or rabbits, do we bond with them individually or as groups? Also, is it possible to gain the trust of a mouse, a rat, a hamster, a guinea pig or a rabbit? Marcie: In my experience with guinea pigs and hamsters, I can definitively say “yes, it is quite easy to gain the trust of individual animals.” I love these little critters; for me bonding with them happens spontaneously. I find that they are relatively at ease with study procedures and experience very little or no apprehension and fear overall! 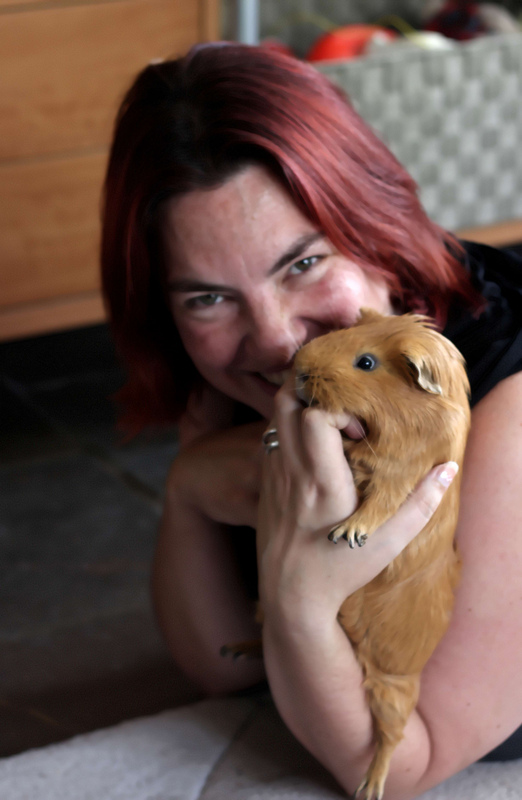 The bond with my guinea pigs and hamsters not only makes the animals happy while in research but it also enriches my life. Viktor: It is my personal experience that it is impossible not to develop a personal interest and compassion for rodents or rabbits, who are being taken care of by me on a daily basis. I think they are all amazing creatures in their own right. It is a touching experience for me when a little rodent sits quietly in my hand and shows no signs of fear. Without my intention, I develop a kind of interest for the well-being of these creatures; that’s probably what the term human-animal bond implies. Ali: We couldn’t agree more! ALL creatures in our care—not only the big ones but also the small ones—deserve our personal interest and concern for their safety and well-being. Jo: About 20 years ago we had a C57/BL female mouse; she had a very sticky eye and the clincial veterinarian asked me to put cream on the eye 3 times a day for 7 days. After two days, the mouse would stand on my hand and tilt her head sideways towards me so I could easily put the cream in her eye without restraining her. I was stunned that a mouse would do this; at first I thought it was by chance, but she did it every time. She made a full recovery. I did visit that little mouse pretty much every day while she was with us. I will probably never forget her.